The GT1080 works best as a short-throw, 1080p gaming projector. Move it away from the wall or use it for the center of your home theater system, however, and you'll be disappointed. If potential TV buyers ever found out how great projectors are, panel manufacturers would be in a heap of trouble. Nine times out of 10, projectors are easy to setup, come with a built-in, decent-sounding speaker and produce a picture that’s just as sharp as their LED counterparts at twice the size. There’s a tenth time, though, where the shoddy speaker, the temperamental picture and the inconvenient setup – not to mention the hefty price tag – make those $250 720p, LED HDTVs pretty appealing. 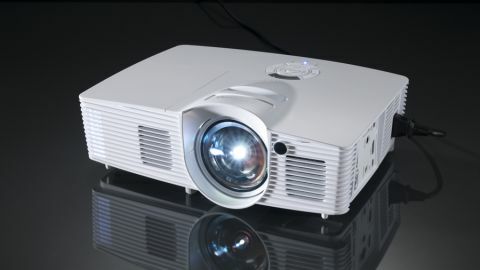 Which group does Optoma’s latest 1080p, $1,399 (about £870, AU$1,600) gaming projector fall into? I’ll give you a hint: It’s not the first one. The GT1080 is a sleek, all-white behemoth, measuring in at 12.4 x 4.0 x 8.8-inches (or 315 x 102 x 224 mm, W x H x D). It’s designed for close quarters gaming and should be placed, at least what I gleaned from my testing, about four to five feet from the wall. In the front, a bulbous lens dominates the panel. Horizontal vents located the left of the lens keep the unit itself cool, but generate an awful lot of heat. Spin it all the way around to the right and you’ll find a plethora of ports – everything from an MHL-enabled HDMI port to mini-USB. It’s not a comprehensive package of every port you’ll ever need (there are no DVI or VGA ports, for example). But, for an entry-level projector, this is a decent setup. On the bottom panel you’ll find three rotating pegs that raise or lower the angle of the projection, while the top of the unit sports an IR sensor, focus slider and basic controls. The GT1080 has a very specific audience that, in all honesty, it doesn’t cater to all that well. Gamers, for the most part, like cool, quiet machines. One of the first things you’ll notice about the GT1080 is that its fans are louder than you’d expect – even if you’re used to projection equipment. Leave it running for a few hours and you’ll run into a new issue: heat. Heat is not something easily quantified without the use of a IR thermometer gun, but if I had to give an educated guess, I’d say it easily raised the temperature in the 12-foot by 12-foot room I kept it in by 10 or even 15 degrees Fahrenheit. The GT1080 isn’t very versatile, either. Placing the projector five feet away (as directed) produced a 100-inch image. But without moving it, there’s no way to increase or decrease image size. The image itself, while fairly sharp, wasn’t the best I’ve seen from a projector – that honor belongs to the Epson PowerLite Home Cinema 3020. That said, the GT1080 makes up for any shortcoming with a quick-pace 15ms response rate. It’s pretty common knowledge, but it’s worth mentioning that projectors work best isolated in a dark room. Any light decreases screen visibility immensely; doing a day-time test with a PS4 didn’t produce favorable results. Even at its highest contrast ratio (25,000:1), the colors in Metal Gear Solid Peace Walker were so dull, Snake nearly camouflaged himself right into the wall. But this isn’t exactly indicative of its average nighttime performance – with shades drawn and the sun down, testing the GT1080 went off without a hitch. Getting great video from the GT1080 is only half the battle. Thankfully, the rest of the fight isn’t so bad thanks to its 10-watt built-in speaker. While not my first choice when listening to music, the low-fi speaker on offer here fills the need for a simple audio solution when watching TV shows or movies. That’s not to say it isn’t loud enough – trust me, it is. It’s just that the quality of sound isn’t up to par with almost any external speaker. This means you’ll almost certainly want to use the 3.5mm jack on the side of the projector to plug in a sound bar or, if it fits in the budget, a pair of speakers. The GT1080 works best as a short-throw 1080p projector that, taking into account its 15ms response rate, strikes a note with gamers. That said, it’s not as versatile as other projectors (remember to keep it within five feet of the wall). Plus, the speaker system, while convenient, isn’t the most high-fidelity option around. If you have the wall space – and the scratch – for a 100-inch 1080p image, then you have have with it takes for a 50-inch, 1080p HDTV for half this price. Unless you’re in desperate need of a short-throw projector for that pitch-black gaming den, then you’re best served spending your money elsewhere.